At Ashbrook Roofing, we offer a wide selection of roofing supplies, down to the smallest and most crucial aspects of a building project. That includes our massive range of roofing nails, which are available in a range of materials. We stock aluminium, galvanised and copper roofing nails, designed specifically for the roofing industry. 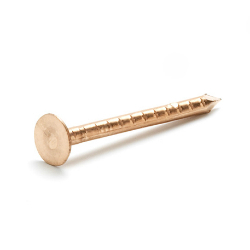 We also supply roofing felt nails, to accompany our broad range of roofing felt. If your building project calls for an effective alternative to nails, it’s worth taking a look at our range of self-adhesive roofing felt, which makes for quick and simple installation. Browse our full selection and buy roofing nails online today. We offer bulk pricing, to help you make big savings when you order in large quantities. Regardless of whether you’re a tradesperson or a DIY enthusiast, we’ll offer the same trade prices on all of our products. Felt Nails - 13mm Galvanised Clout Nails: Pack 100.